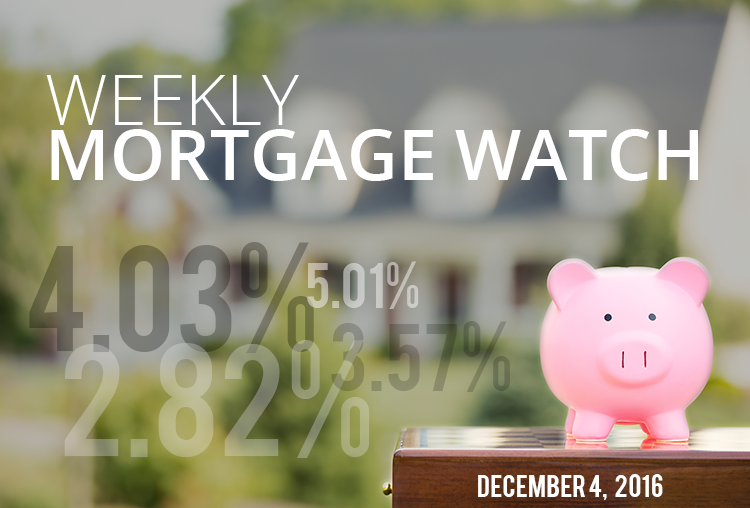 Last week, mortgage rates continued to move upward, but the increase was less than in recent weeks. Economic data continues to point to a slowly strengthening economy. GDP, Consumer Confidence, and the ISM Manufacturing Index all bested expectations. Job creation proceeded as expected, with the unemployment rate dropping to 4.6%. However, the majority of the decrease was due to a sizable retraction in the participation rate. This latest round of economic news almost virtually assures that the Federal Reserve will increase its Fed Funds Rate at its December Meeting. While mortgage rates have reclaimed 2016 highs, part of the increase has been a reaction to the election. It bears remembering that rates could begin trending downward based on poor economic data or if we get signals that the new administration will not be as business-friendly as some analysts predicted. This week is much lighter in terms of economic data due. Rates may move upward again, but it is unlikely to be as drastic as previous weeks unless we see some unexpected and surprising news. With online shopping expected to exceed 50% this year, the criminal element is ramping up their expectations for snagging boxes off of porches. According to a recent study by InsuranceQuotes, over 23 million Americans have had thieves swipe delivered packages from their property. If you are unlikely to be home when a package is to be delivered, experts advise using UPS, FedEx, or parcel locker services like Amazon Lockers to have goods securely delivered.